Beachmount House selfcatering est situé au-dessus de Ventry Harbour et Dingle Bay. C'est une maison de 5 chambres pouvant accueillir jusqu'à 10 personnes confortablement. Draps et serviettes inclus et chaise haute et lit bébé également inclus. À distance de marche de Ventry Village avec le pub, le bureau de poste / la supérette, le restaurant et la très belle plage Pavillon bleu de Ventry. Dingle way marche et le pèlerin à proximité. Avec des paysages accidentés et des vues panoramiques, c'est l'endroit idéal pour la randonnée et pour ceux qui aiment les grands espaces. Le mont Brandon, l'une des plus hautes montagnes d'Irlande, se trouve également à proximité. A cinq minutes de la maison se trouve le centre équestre et de trekking de Long, avec des visites guidées de la localité qui vont des débutants aux plus expérimentés. À une courte distance en voiture de Slea Head, le point le plus au sud-ouest d'Irlande s'arrête d'être «l'Amérique». C'est aussi l'endroit où Ryan's Daughter and Far and Away a été filmé. Vous resterez avec nous une fois et vous reviendrez encore et encore. 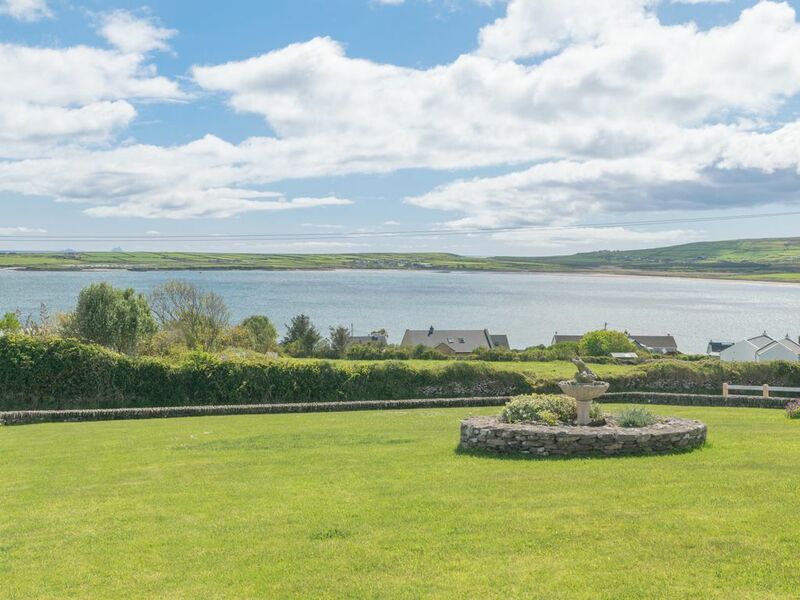 Grand jardin donnant sur Ventry Harbour et Dingle Bay avec des meubles de jardin. Parking privé. Tarifs hors saison réduits disponibles et tarif spécial pour les réservations combinées de Noël et du nouvel an. Amazing place wonderful hospitality and beautiful! A warm, comfortable house with beautiful views and a great owner. We had a wonderful stay in this house. There were 6 of us and we had room to spare. The kitchen is well equipped with plenty of room for meals and games. The bathrooms and showers modern with plenty of hot water. The living room is large with stunning views and a fireplace for cozy evenings. It is located just a few miles from all the activities in Dingle but without all the tourists in that town. There is a small grocery and a good pub just a quarter of a mile away. Breda is most helpful and knowledgeable about the area. We recommend this house highly. The Ring of Dingle is a fascinating area with ancient structures and breathtaking scenery. We drove it three times and saw new things each day. Breda is wonderful and everything about our stay was great. The location is amazing and Breda makes it work so well. Well maintained house with amazing views! We have been the first time in beachmount house, and we will definitely come back again. This house has everything you need in your holiday and much more! Thank you Breda for letting us spend our holiday in your house! We have stayed in this home many times. We wouldn't stay anywhere else. The home is well appointed. It is always spotless and supplied with plenty of towels and kitchen supplies. We love that most of the rooms look out to the ocean, even the kitchen. It sure makes doing dishes a pleasure to be able to look out at Mount Eagle and watch the sun go down. Walkings to Quinns pub or to the Skipper restaurant are an added bonus. There is plenty of room for a large group. The fireplace can really kick out some heat on a cold night. We love making a nice fire and curling up to watch a good movie. This home is locally owned so if you have an issue it is resolved quickly and with care. The owners are very friendly and will make sure your stay is amazing! We recently stayed at Beachmount House with extended family. There were nine of us and there was plenty of room. The owner, Breda, was very easy to work with. The house was exceptionally clean and the views as shown - simply beautiful. During our stay we spent time in Dingle, enjoyed the quality entertainment a the pubs, walked along Ventry Bay, saw impressive Connor Pass and drove along Slea Head Drive and saw the bee hive huts, ring forts and numerous other interesting historical sights and the beautiful mountains and sea coast. We also took a boat ride out to the Blasket Islands. I highly recommend this house and location. Please contact owner for off season rates and rates for 1 to 4 people. Holidays and special events . Special rates for combined Christmas and New Year.